Gina Armfield shows us how to remove all the excuses from our vocabulary and begin today creating. As you listen to Gina you will realize there is now time like the present to start creating. Exciting News! I am going to be launching my new website in October! So to take out the old and bring in the new I will be closing out some of my old online workshops. The following workshops will be availble for purchase until Oct 1, 2013. You will still be able to access them as often as you wish for as long as you wish once they are purchased - just save your log in info. But they will no longer be offered. Come take a workshop with me! There are a few spots left so sign up ASAP. Based on my upcoming book and dvds by the same name by Northlight Publishing. The program is centered on using a desk calendar as the basis of an art journal while incorporating art journaling, goal setting, writing, idea making, sketching, watercoloring, and collage. It is a daily, weekly, and monthly system that provides prompts, ideas, quotes, poems, and reminders to add to your journal. ephemera such as menus,business cards, plane tickets, stickers, etc. Feathers, mushrooms, botanicals, buttons, butterflies, eggs, … just to name a few!We all love to collect those things that we find beautiful and peak our senses. Inspired by vintage illustrations of old we will use a moleskine notebook to document our collections while we learn pen and ink and watercolor skills. No painting or drawing experience is necessary. A blog reader asked if I would ever share my color palette. Why of course silly! All you have to do is ask! It was actually a very fun little project to put together. So here is a little video on how to set up a palette. 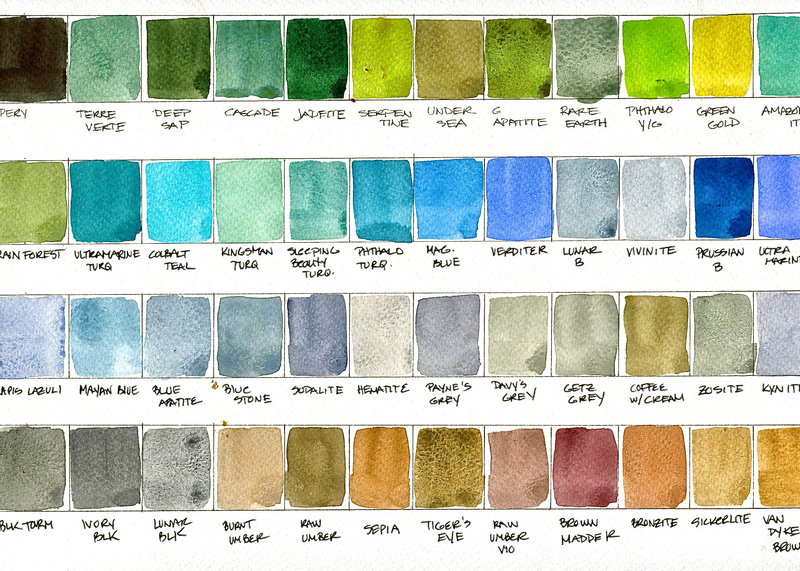 creating a palette from gina armfield on Vimeo. 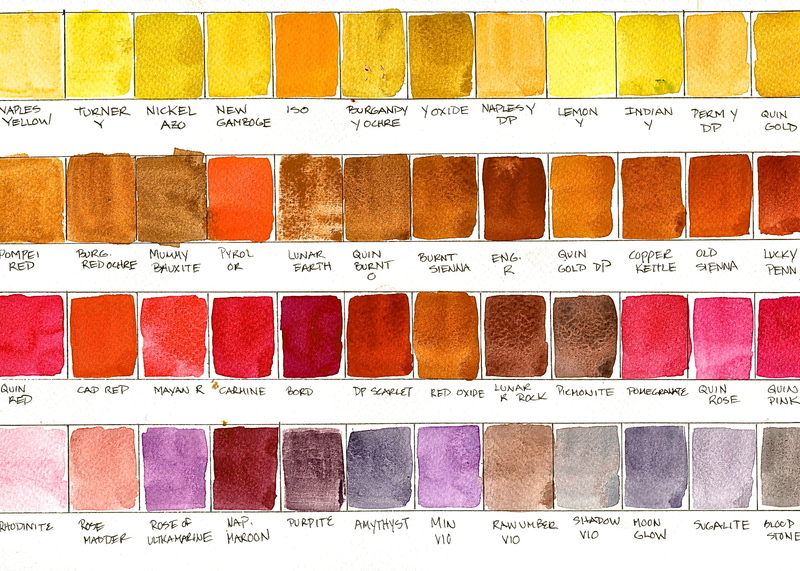 And here are my color charts of the paints that I use. Colors are listed but not brands. So you will have to do a wee bit of research ; however, I can tell you that these are the brands I use - Daniel Smith, Holbein, and American Journey by Cheap Joe's. You can download the charts and print them out as I did above and put them in your No Excuses Journal as a handy dandy reference. For the large version click on view this photo to download. For more on setting up your palette check out these posts! I have been putting together a new No Excuses Journal for 2013-2014 using a Moleskine. Doesn't it look yummy with all the colorful Washi Tape along the side? Check out this video to see a few tricks for tipping in your envelopes and watercolor paper. ne moleskine from gina armfield on Vimeo. I am offering a BUY 1 GET 1 FREE special on all of my online classes for today only! Just enter the code: TGIF in the message to seller's box upon checkout (if you can't find it then just email me directly at ginarossiarmfield@gmail.com with the code) Once your transaction is complete you will be refunded the amount of the Free class of equal or lesser value. ALL OF MY WORKSHOPS ARE EVERGREEN! You can start and revisit them whenever you like - no time limits! Please be sure to keep your log in info however so that you can access them as often as you care too. I do ask that you do not share this with others. The purchase of the class is for single use only. My online workshops provide clear step by step instructions as well as how to videos so that you feel as though you are taking a live class from me. All of my workshops can be purchased and started at any time. You can take as long as you need to finish the class and return as often as you like. In this way you can work at your own pace. I only ask that you do not share the password with others but use the workshop that you purchase for your own personal use. Click on any of the TITLES below for DETAILS AND TO REGISTER!